Also serving communities of Highland Park. There are 15 Assisted Living Facilities in the Edison area, with 3 in Edison and 12 nearby. 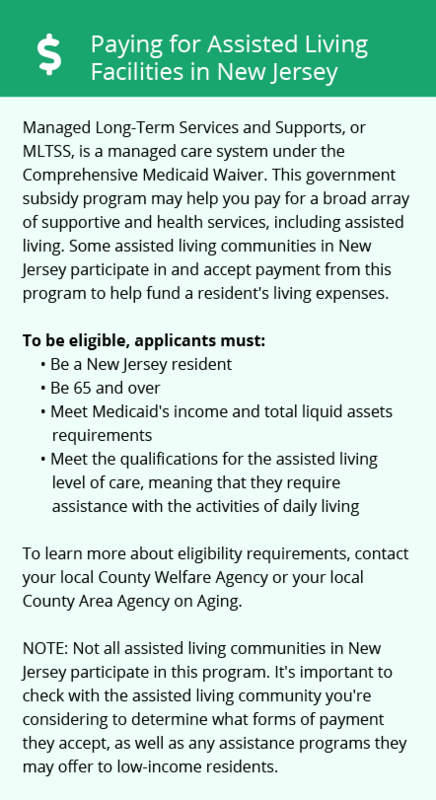 The average cost of assisted living in Edison is $4,964 per month. This is higher than the national median of $3,346. To help you with your search, browse the 114 reviews below for assisted living facilities in Edison. On average, consumers rate assisted living in Edison 3.9 out of 5 stars. Better rated regions include Somerset with an average rating of 4.2 out of 5 stars. Caring.com has helped thousands of families find high-quality senior care. To speak with one of our Family Advisors about assisted living options and costs in Edison, call (855) 863-8283. The township of Edison, New Jersey, is a one-hour drive away from New York City, which is great for seniors who might enjoy a day out in the Big Apple. Around 14 percent of the population of Edison is aged 65 or over, and a percentage of them may require support with their day-to-day lives. Assisted living facilities help provide support for seniors. There are 15 of these communities in and around the Edison area, with three in the township itself and 12 in nearby communities such as East Brunswick and Somerset. All of these communities are regulated by the State of New Jersey Department of Health. The township of Edison, New Jersey, is steeped in culture and history. There is a historical society that seeks to preserve its history, and also an arts society. Famous for being the location where Thomas Edison created hundreds of his inventions, The Thomas Edison Center at Menlo Park may be of interest to seniors wishing to learn about one of the most famous inventors of all time. Edison has an array of community resources for seniors, including Edison Senior Services, an organization that provides a range of services including arts and crafts and exercise groups, as well as seven other senior centers. The Edison area is home to world-class medical facilities, including the Hackensack Meridian Health JFK Medical Center, in the event of medical emergencies or illness. The cost of living in the Edison area is almost 50 percent more expensive than the national average. However, healthcare in this area can be around 3 percent cheaper than the national average. This may be something to consider for seniors who have health conditions. Edison has public transport options for seniors who do not drive. There is also a free transportation service provided by the Edison Senior Citizen Center for local seniors who do not have access to a car. Residents of Edison do not have their Social Security payments taxed, in accordance with New Jersey state law. Assisted Living costs in Edison start around $4,964 per month on average, while the nationwide average cost of assisted living is $4,000 per month, according to the latest figures from Genworth’s Cost of Care Survey. It’s important to note that assisted living rates in Edison and the surrounding suburbs can vary widely based on factors such as location, the level of care needed, apartment size and the types of amenities offered at each community. 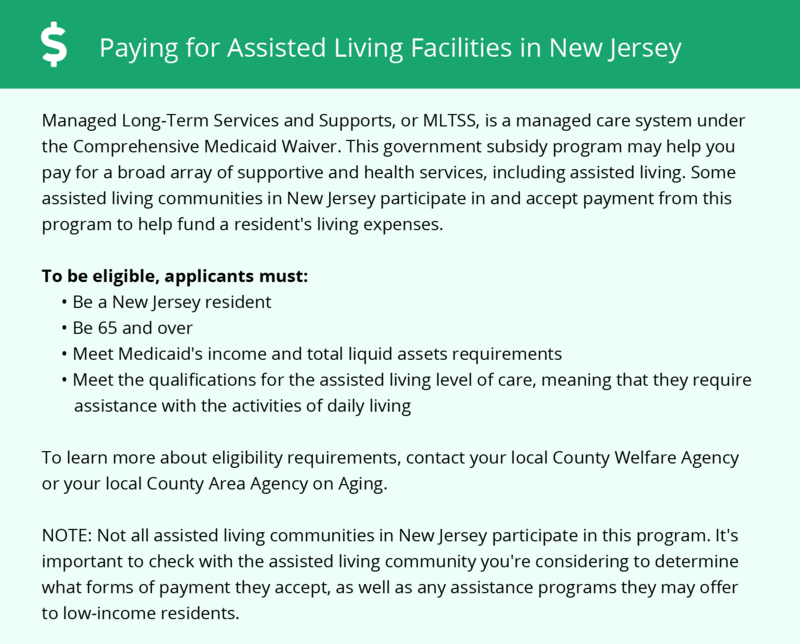 Residents of the Township of Edison who are eligible for financial support for assisted living can access it via New Jersey's Medicaid Managed Long Term Services and Supports (MLTSS). Edison and the surrounding area are home to numerous government agencies and non-profit organizations offering help for seniors searching for or currently residing in an assisted living community. These organizations can also provide assistance in a number of other eldercare services such as geriatric care management, elder law advice, estate planning, finding home care and health and wellness programs. To see a list of free assisted living resources in Edison, please visit our Assisted Living in New Jersey page. Edison-area assisted living communities must adhere to the comprehensive set of state laws and regulations that all assisted living communities in New Jersey are required to follow. Visit our Assisted Living in New Jersey page for more information about these laws.